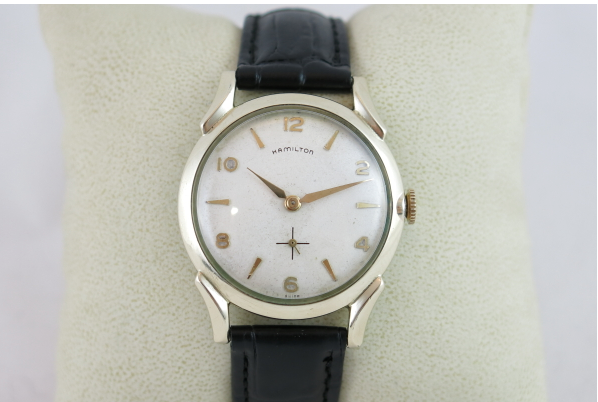 The Hamilton Paxton is an interesting anomaly among Hamilton models. It has a "B" model that precedes the regular, non-B model. Generally the B model follows the regular model and represents a change in the movement used. Many times the catalogs don't even state the change... the B just shows up inside the case. You can't tell the difference between a regular model and a B model from the outside. For example the Boulton uses the 19 jewel 982 movement and the Boulton B uses the 19 jewel 753 movement that replaced the 982 in 1952. There were lots of B-variants in the 1950's. 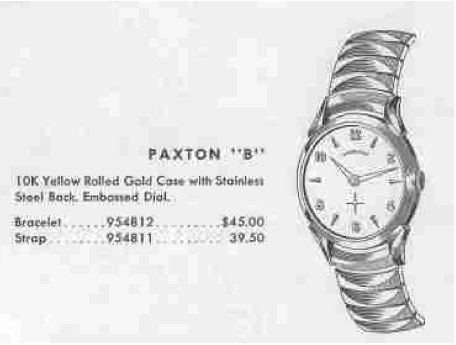 In 1956 Hamilton introduced the Paxton "B". 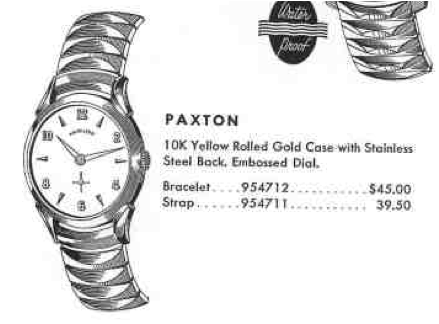 Then the Paxton was introduced in 1957. It was also produced in 1958. I recently received a Paxton B project watch. As received, it was quite dirty and a little scratched up. However, it was running so I knew it would make a nice project watch. 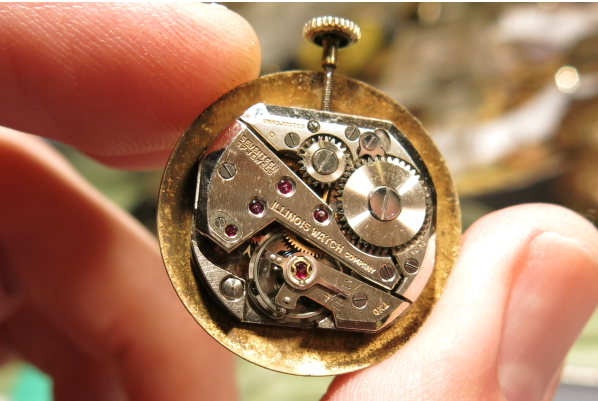 Under the dial is a Hamilton Illinois 12/0-sized movement. I'm not that familiar with the Illinois movements from the 1950's so I'm not sure what the model number is for this movement - it says TXD on the balance bridge but that's the import code for Illinois. Imported Hamilton movements have HYL on the balance bridge. I suspect Illinois movements didn't get a specific caliber movement. 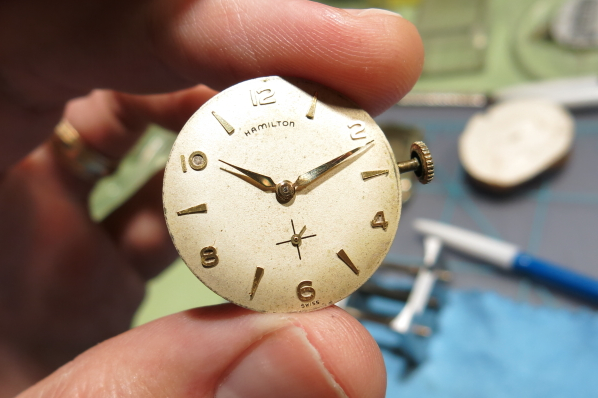 The dial was dirty, but original with a nice white finish and embossed gold numerals and markers. 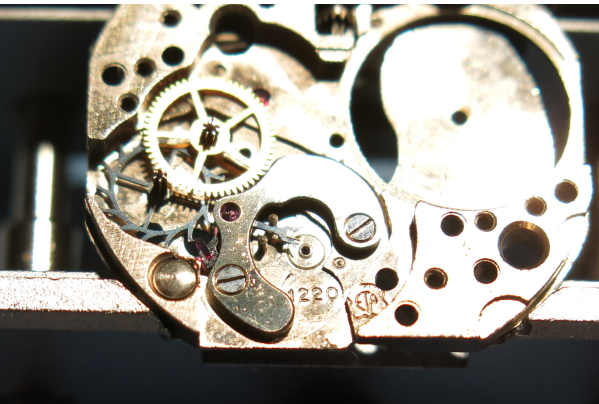 The Illinois movement is Swiss-made and it's stamped ETA and 1220 under the balance. So this is an ETA 1220 - which is what I would need to know if I needed to buy a part for it. And here it is all cleaned up and timed after a fresh overhaul, the crystal polished, the dial lightly cleaned and a new black alligator-grain strap installed. The 'TXD' is the import code, a requirement for the US market. Different companies had different codes. Elgin's was YXY, for example. These identified the importer, not the movement manufacturer. Nice piece! Reminds me of a Lord Elgin Wakefield. 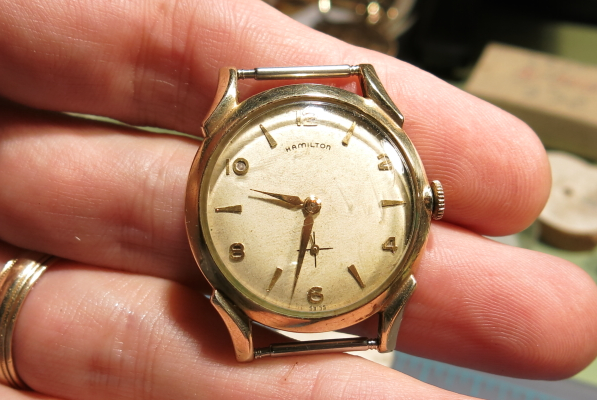 How much does a watch like this sell for?